Say sayonara damage, and give your hair a vibrant boost of luscious radiance. 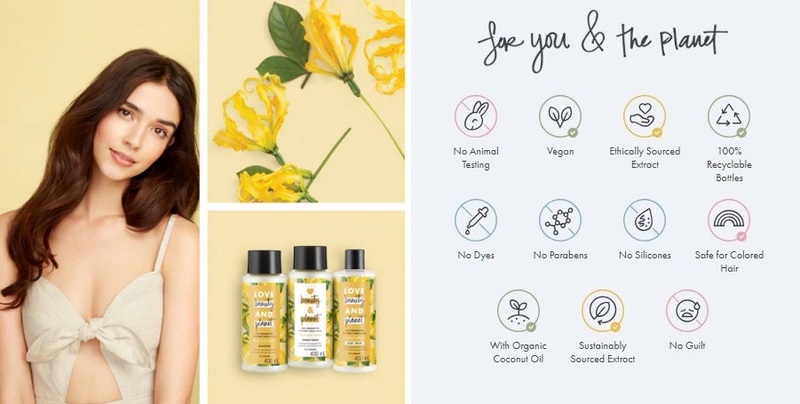 Love Beauty and Planet Hope and Repair Shampoo, infused with virgin coconut oil - something we all are crushing over, gives your hair the magnificent moisture it needs to look healthy and feel strong. Give your locks some love with our supremely hydrating Love Beauty and Planet Hope and Repair Conditioner, designed with fast-rinse technology, this conditioner gives your hair light weight conditioning and also speeds up the rinsing process which can help you save some water. But we trust you to pay attention and go easy on that tap too! If you have curly hair, the moisturization of this product is a blessing. Sometimes dry hair need some loving care. Our formulas are infused with organic virgin coconut oil. From what’s called the “Tree of Life” in the Philippines, coconut oil is known to be hydrating and is sourced by our suppliers from local farms that harvest fresh coconuts to get this golden coconut oil. We also make the shampoos free of colorants, silicones, and parabens. We do not test on animals and our products are 100% Vegan too. I first noticed the smell ; it is sweet and has a hint of coconut oil but not too overpowering, which I really like! A week of using this shampoo and conditioner, my hair is now bouncier, smoother and it somehow feels thicker. I have less hair falls too. The texture of the shampoo feels luxurious. Love the design of the bottle. Easy and practical to bring during travels because it is not easily pressed or leaked. However, the conditioner could perhaps use a pump bottle since the texture is thicker and it is quite hard to push product out when it is left with less than 50% content. The price point is okay with what it offers. I also love the fact that it is vegan, with no silicones and parabens. It would be a better formulation though if it can substitute SLS with other altenatives. I choose to test for a week before i submit this review.My first impression for this product is great smell!This is because when i received the parcel, it spilled.So,the whole house says that "Where this great smells come from?" I love the smell of the shampoo and conditioner. I used to have dry hair but the conditioner that is easy to wash off leaving the hair soft and silky. The only drawbavk is the packaging which is not handy to hold. Second, usually when I shampoo my hair, I do it so quickly since I'd rather focus on the conditioning part. But, with Love Beauty & Planet, it was such an easy lather that I actually enjoyed and took some more time with it. Also, since I have oily hair (at the roots) and somewhat dry, damaged hair at the tips, having virgin coconut oil helps a lot in making sure my hair is moisturized without being greasy, especially towards the end of the day. For the conditioner, I agree that it's so much easier to rinse, thus saving both time and water. Plus, I am not that scared that I will have leftover product on my skin, which causes back acne, or skin irritation. My only concern is that, I feel like I have used other conditioners that have higher moisturizing content, and make my hair much smoother, though if that means more chemicals that ultimately damage my hair, then I guess I would rather stick to natural, since I have now found another option. One more suggestion, is to change the packaging of the conditioner, since the product is quite thick, as compared to the shampoo, and it's more difficult to dispense this way. I must say, this range costs a bit more than my usual products, but I guess it's a reasonable price to pay, if my hair stays healthy and beautiful. Overall, I am delighted with the product. Considering that it is made of natural vegan ingredients, with no paraben or silicon, and is ethically-derived from sustainable sources, while at the same time giving me splendid results, I am definitely going to continue using it. Now I can love my hair and the environment at the same time!